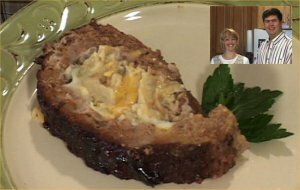 See the video of Dan and Kim making Wagon Wheel Meatloaf. Click here to watch the video. If you have a slow Internet connection, click here to see lower-quality video clip. Mix ground beef, egg, 1/2 onion and bread crumbs together. Roll the meat out in between two pieces of freezer wrap or wax paper. Sautee green peppers, 1/2 onion, and celery in the butter. Spread the sauteed vegetables on top of the rolled out meat. Layer the mashed potatos on top of the vegetables then place the diced cheese cubes on top of the mashed potatos. Roll the meat into a loaf and pinch the ends together. Place in a casserole dish, seam down. Top with barbecue sauce and bake at 350 for 45 min to 1 hour.